There was an error during move operation. 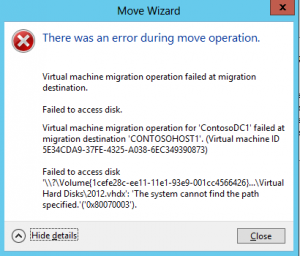 Virtual machine operation failed at migration destination. Failed to access disk. The system cannot find the path specified. It should be noted that it is still not a good idea to use differencing disks in production. Handy as they are for lab environments.